Who can access the lockboxes? It is also a fact that difficult access is near 100% certain to result in a longer time to the sale, and probably a lower price. Thus the need for a lockbox – a secure repository attached to something exterior to the home that has a key to the front door. Obviously the “repository” must not be accessible except by persons who should have access, and the attachment needs to equally secure. Usually the lockbox is attached to the pipe of a gas or water meter near the front of the home. Fortunately, the lockbox technology inherent in the electronic Supra lockboxes provided and controlled by ARMLS is truly extraordinary. Pictured below are the SUPRA electronic iBox, and the eKey most often used to access these lockboxes is the Supra “ActiveKey”. The iBox is almost 8 inches tall and is hefty – weighing over 2 lbs. 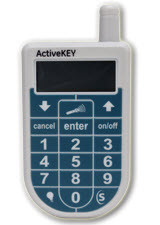 The ActiveKey will fit in the palm of your hand. Infrared technology allows the ActiveKey to access the iBox key container and the keys placed there. The Realtor® enters the PIN number to his/her ActiveKey that is unique to that ActiveKey, then points the beam at the iBox infrared “eye” to interact with the lockbox. The unique PIN ensures that the ActiveKey and system is secure even if the ActiveKey is lost or stolen. Each time an iBox is opened, both the ActiveKey and iBox record the date and time of access, and each records the the other’s ID number. Using its cellular radio, the ActiveKey immediately sends all of this information to the secure database on SupraWEB. the iBox number is used to identify its Realtor® owner, the Listing Agent, as well as the property address the Listing Agent has assigned to the iBox on SupraWEB. The Listing Agent is then immediately sent an email and a text conveying all of that information, including the property address and the ActiveKey owner’s name and phone number. The effect of all this is that the Listing Agent is made aware of the details regarding the property access within a couple minutes of when the iBox is activated … sometimes even before the accessing parties have gone through the front door. In addition to Realtors®, certain vendors, like inspectors and appraisers, are provided ActiveKeys by ARMLS, but this is very carefully controlled and those vendors must be registered with both ARMLS and the Supra system. Other mechanical lockboxes are sometimes used to provide access to contractors, utility company employees and others who have need of access when neither the owner or List Agent is available to enable access. These can be reasonably secure if the PIN information is given very careful and very limited publication, but none of these is in the league of the Supra system.